Uses of PRESENT CONTINUOUS 5. Development, changing situations. The population of China is rising very fast. 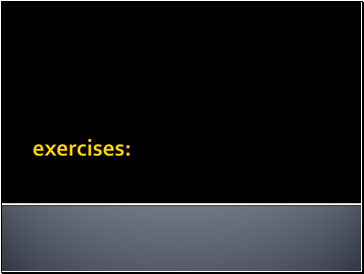 The sentence describes a development from one situation to another. 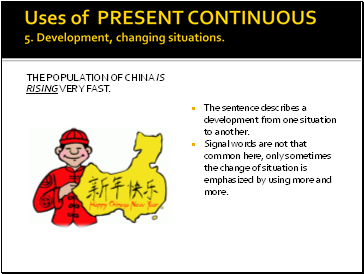 Signal words are not that common here, only sometimes the change of situation is emphasized by using more and more. he is always coming late to class. 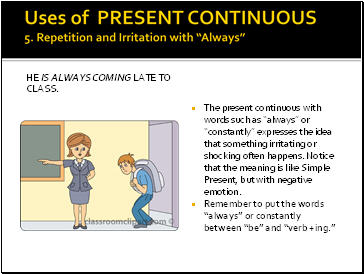 The present continuous with words such as “always” or “constantly” expresses the idea that something irritating or shocking often happens. 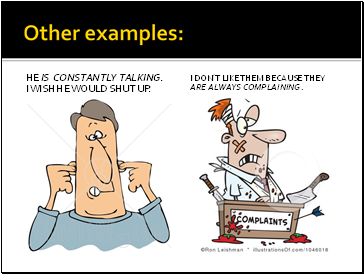 Notice that the meaning is like Simple Present, but with negative emotion. I wish he would shut up. 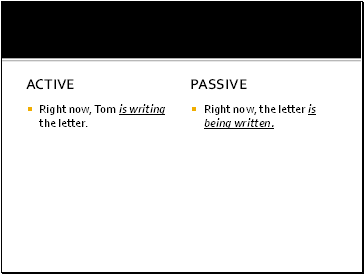 Right now, Tom is writing the letter. Right now, the letter is being written. Using the words in parentheses, complete the text below with the appropriate present continuous tense. 1. Shhhhh ! Be quiet! John (sleep) _. 2. Don't forget to take your umbrella. It (rain) _. 3. I hate living in Seattle because it (rain, always) _. 4. I'm sorry I can't hear what you (say) because everybody (talk) so loudly. 5. Justin _(write, currently) a book about his adventures in Tibet. I hope he can find a good publisher when he is finished. 6. Jim: Do you want to come over for dinner tonight? Denise: Oh, I'm sorry, I can't. I (go) to a movie tonight with some friends. 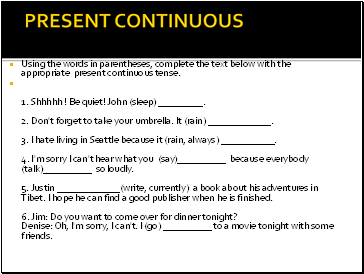 Using the words in parentheses, complete the text below with the appropriate present continuous tense. 1. Shhhhh ! Be quiet! John (sleep) _is sleeping . 2. Don't forget to take your umbrella. It (rain) _. 3. I hate living in Seattle because it (rain, always) _. 4. I'm sorry I can't hear what you (say) because everybody (talk) so loudly. 5. Justin _(write, currently) a book about his adventures in Tibet. I hope he can find a good publisher when he is finished. 6. Jim: Do you want to come over for dinner tonight? Denise: Oh, I'm sorry, I can't. I (go) to a movie tonight with some friends.